January 12, 1951 – Four Chicago firefighters lose their lives and seven other firefighters and two civilians are injured in a fire and subsequent explosion at a four-story warehouse and office building at 320 North LaSalle Street. The fire begins in the lower portion of the 75-year-old building with the first alarm turned in at 2:04 p.m. 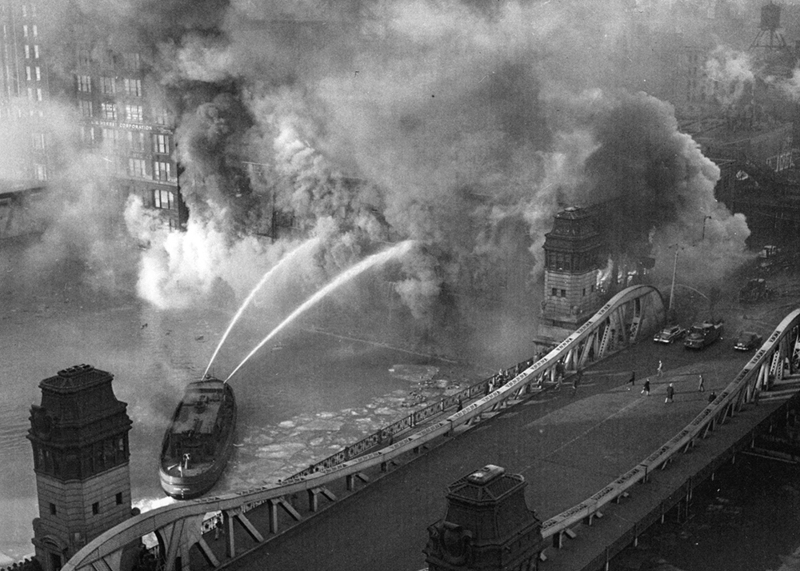 Ultimately 68 pieces of equipment are brought to the scene, and the LaSalle Street bridge remains open for 54 hours to allow fireboats to operate on the river. Within 30 minutes of the first alarm the fire spreads through the elevator shafts of the building, setting off an explosion that blows out a wall, toppling it onto firefighters using hose lines on fire escapes and ladders in an adjacent alley. Lieutenant John Schuberth of Engine 42, Firefighter John P. Gleason, also of Engine 42, Firefighter Henry T. Dyer of Engine 11 and Chicago Insurance Patrol Firefighter Patrick Milott lose their lives in battling a blaze that keeps fire crews on the scene for several days. 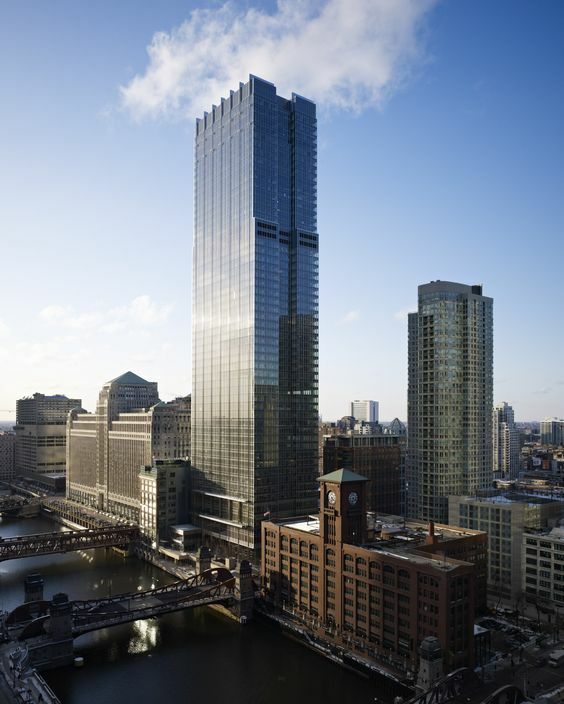 Today 300 North La Salle, a glitzy high-rise designed by Pickard-Chilton, occupies the site. Note in the photo of the modern building the 1912 building designed by Gustav Hallberg still sits on the river to the west. January 12, 1881 – The Chicago Daily Tribune reports that Mr. John D. Parker has been successful in “obtaining the signatures of all the property-owners on La Salle street as far north as Madison, and also of three or four between Madison and the river, to a petition to the City Council urging that body to declare vacant that portion of La Salle street between Jackson and Van Buren.” Parker is a prime mover in the effort to re-locate the Board of Trade to the property that the petition concerns. Three other sites are possibilities for the new headquarters – one on Wabash Avenue between Van Buren and Harrison; another at the corner of State Street and Van Buren; and the third on the block bounded by Jackson, Van Buren and Third and Fourth Streets. How different any of these areas – especially the site Parker and his allies favored – would look today if the critics of the plan had found a sympathetic hearing at City Hall and the politicians had refused to go along with the plan. In a little over four years the vacated section of La Salle Street would give rise to the 1885 Board of Trade building, the opening of which is heralded in the announcement pictured above. 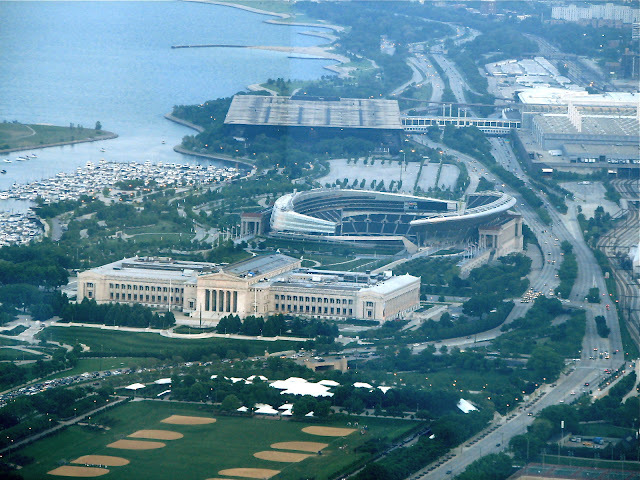 January 12, 1924 -- D. C. Davies, director of the Field Museum of Natural History for ten years, announces that the museum's new building has been completed. The original four million dollar gift of Marshall Field had, with interest, grown to $6,300,000 which was somewhat less than the cost of the seven million dollar building south of Grant Park. The shortage was made up with donations from some of the wealthiest members of Chicago society -- Captain Marshall Field, Stanley Field, N. W. Harris, James Simpson, and Edward E. Ayer. 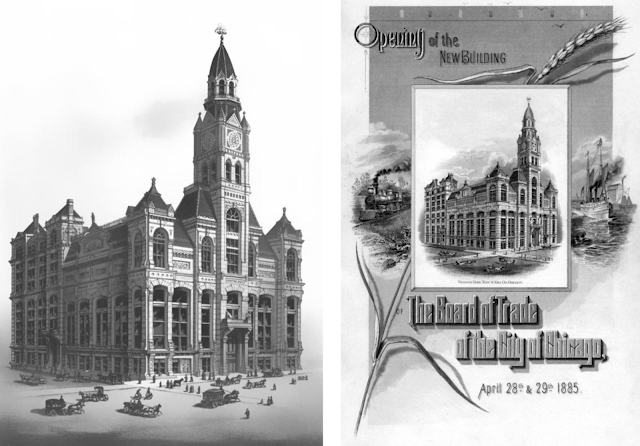 The architectural firm that designed the beaux arts building on the lakefront, Graham, Anderson, Probst & White, also made a contribution. More than a quarter-century after it was first proposed, after years of political wrangling over its location, the museum was finally complete.